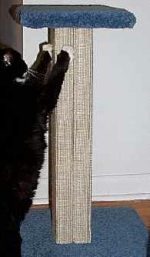 Sisal Weave Pedestal-Style Cat Scratching Post 24"
Two foot high (24") pedestal-style scratching post wrapped in a TIGHT SISAL WEAVE. All wood construction, finished in plush carpet. Shipped with base off. Bolts, tool, and easy instructions provided. Offered in blue, green, & earth tone. Please indicate second and third choice color. Also, To avoid shipping delays, please select your state from the drop-down menu.